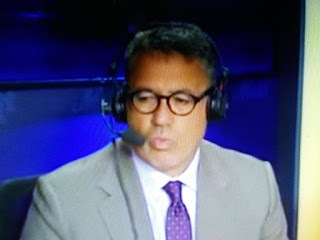 For the past week or so former Mets starter turned broadcaster, Ron Darling, has gotten into a controversy concerning comments he wrote in a book about former teammate Lenny Dykstra. I didn't care enough to write about it and I still don't . But, during tonight's game between the New York Mets and the Atlanta Braves, Darling told the TV audience that he would be leaving the broadcast booth to have surgery next week to remove a mass in his cheat. He went on to say if all goes well, his doctors said he may return to work in May. I sure hope that is the case because this sounds pretty serious to me! The other stuff going like lawsuits and he said verses he said is just petty. Good luck, Ron! I hope and pray Ron Darling will be fine. Scary!